Here are three more of the new Hollyhock Days Critter Collection. 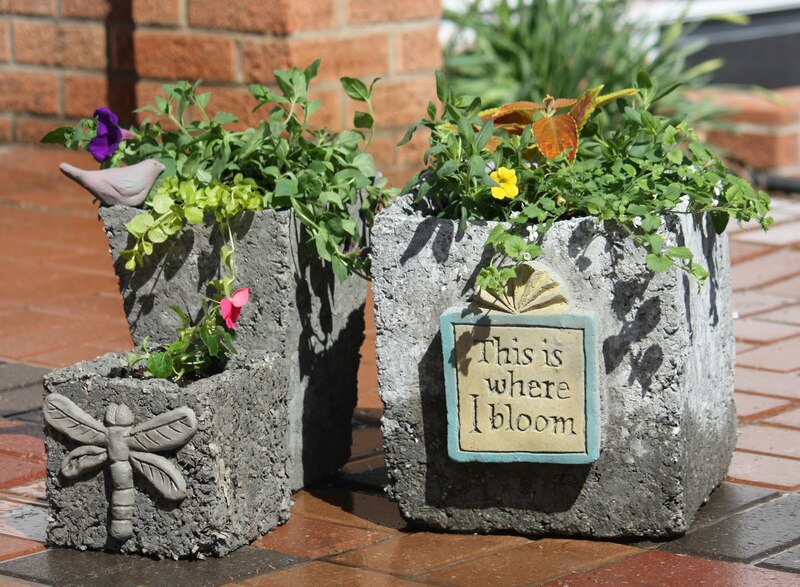 These are shown as garden stepping stones. They will also come in the form of garden stakes. 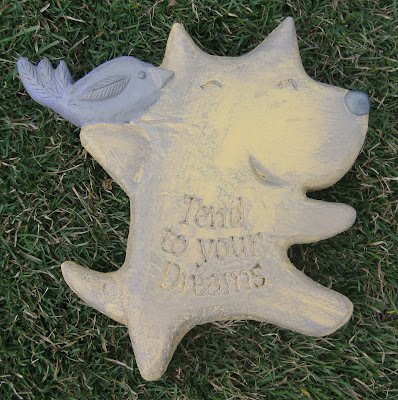 We'll have fun new critter stones coming for this spring along with a whole new collection of inspirational message tile stones. Here are the first samples from each of these groups. 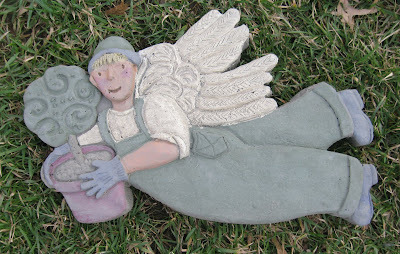 Mr. "Green Jeans" the gardening angel kicks off the line-up of new stepping stones featured at our upcoming sales event, Hollyhock Days. 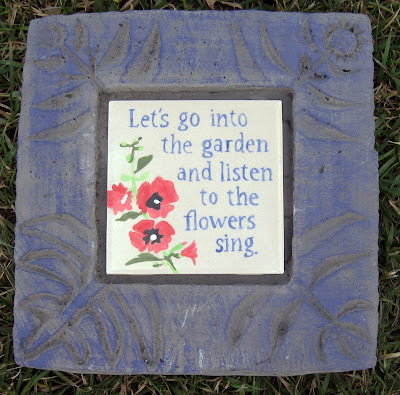 This type of stone works well as a starting or ending feature of your garden path. 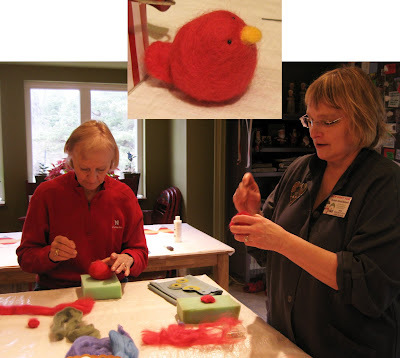 Robin Mackintosh demonstrates how to begin the head of the bird we made in our needle-felting workshop. Wool is an amazing material with interesting properties. It begins to form a dense mass when poked repeatedly with a barbed needle. 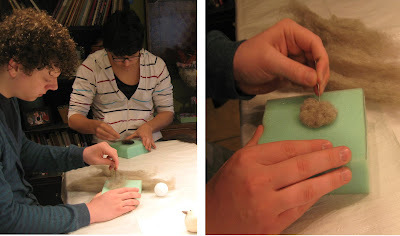 The wool used for needle-felting is called "roving". Roving is cleaned, carded and sometimes dyed wool that is ready for spinning. 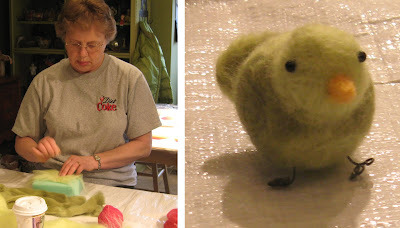 Betty used two tones of green wool to make her bird. 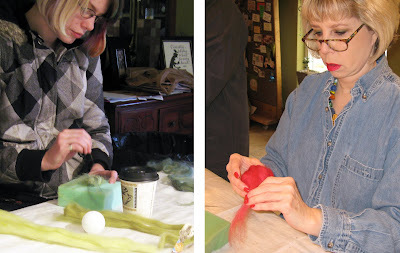 Robin shows Phyllis how to begin her bird's body by wrapping a foam ball with roving and then poking it with the barbed needle. 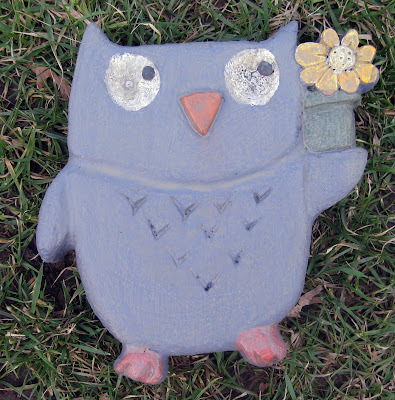 Here are two shots of the owl I made; one in progress and the other, finished. I used tips of pheasant feathers for my owl's chest feathers. 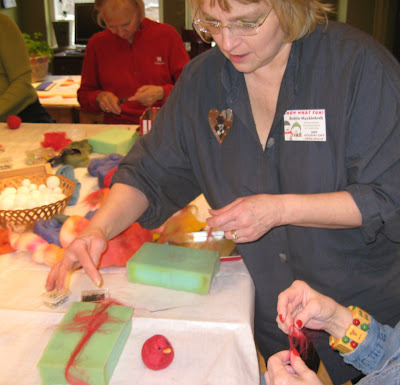 Maggie pulls out small strips of wool to begin the head of her red bird. Davey and Blaze got into the action too. Blaze made a crow from natural black sheep's wool and Davey made a wren from natural brown wool. It came from the flock of Bill Jones, the very talented and gifted Renaissance man from Liberty, Mo. Bill makes the wonderful natural soaps and skin cremes we sell at our spring and holiday sales events. Sarah is a fibers major at KCAI. She has worked as an assistant in my studio for five years and has a very promising career as an artist. 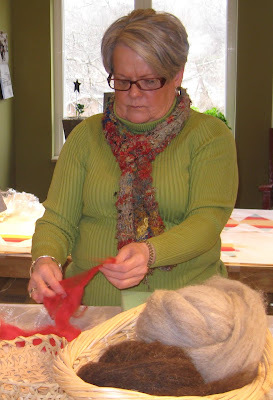 She loved the wool roving that was dyed with multiple shades of green. Her bird was the hip type sporting the tie-dyed look! Linda loves red and was happy there was plenty of red roving for her bird. 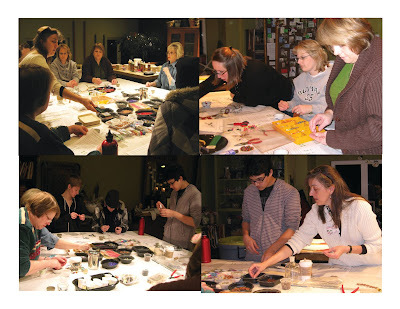 If this workshop looks fun to you, check out the series of workshops offered at From the Summer's Garden. 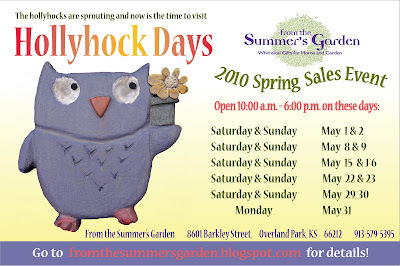 The most recent posts on the blog are the dates for the Summer/Fall Hypertufa and Handmade Paper Studios. Come join the fun! 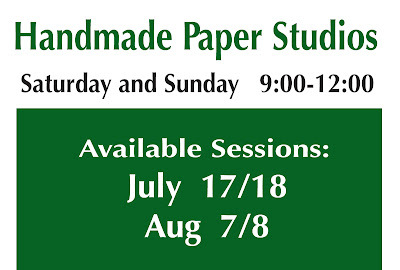 2010 HANDMADE PAPER STUDIOS- SIGN UP TODAY! 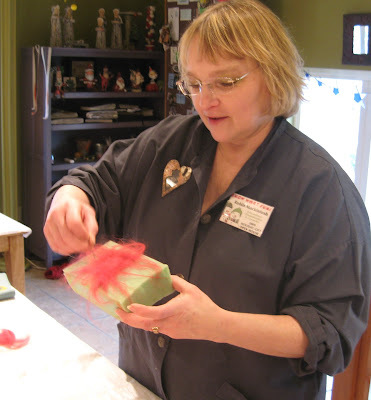 The Handmade Paper Studios provide the opportunity to explore the craft of handmade paper making using natural elements from the garden and recycled materials. It's fun to experiment in the creation of beautiful papers and using them to make bowls, cast ornaments, memory-keeping books and paper-mache figures. You'll have the choice to make guided projects or branch out on your own. The cost for the two-day session is $65.00 with most materials included. 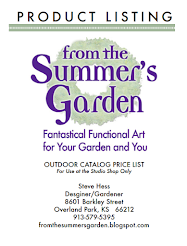 SIGN-UP BY SENDING YOUR DESIRED SESSION DATES TO summersgarden@everestkc.net OR BY CALLING STEVE AT 913-579-5395. Get an idea of the fun you will have during a Handmadde Paper studio by viewing pics of the action from 2009. All sessions for 2010 Hypertufa Studios are filled. If you would like to be placed on a waiting list in the event there is a cancellation, please email Steve at summersgarden@everestkc.net. 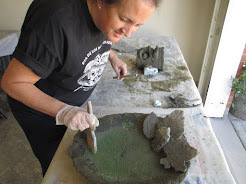 The Hypertufa Studio offers a collaborative experience where you learn to make Steve's "green" version of HYPERTUFA, a mixture of cement, sand and recycled paper. It is a fascinating medium with great creative potential. 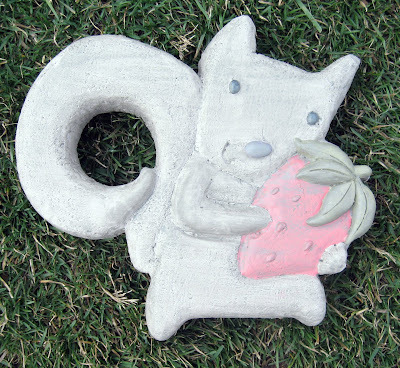 You will mix, mold and sculpt cement and hypertufa into unique and functional garden art including planters, platters, bird baths, stepping stones...if you can imagine it, we'll try to make it! 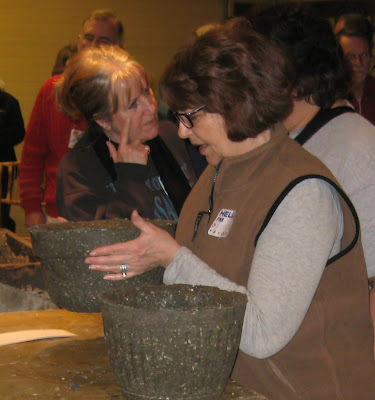 Studio sessions are open to both beginners, who may prefer specific projects, and experienced hypertufa makers with a project or two in mind. Most participants happily take home 4-5 finished items from each session. Each session is made up of a Saturday and Sunday morning. Get an idea of the fun you will have during a Hypertufa studio by viewing pics of the action from 2009. 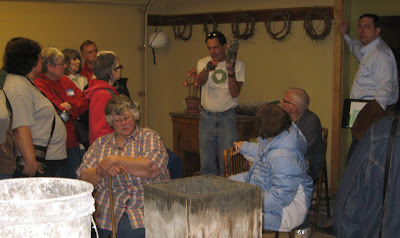 The Johnson County Rose Society held their March meeting at the studio of From the Summer's Garden. 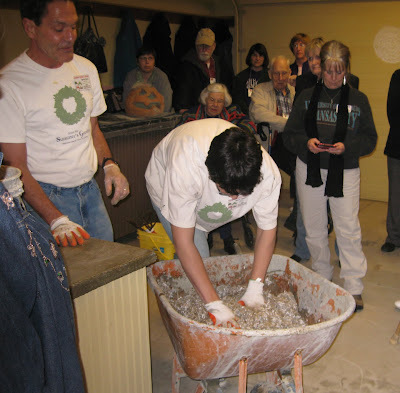 I demonstrated and discussed the steps in making my recycled paper hypertufa. 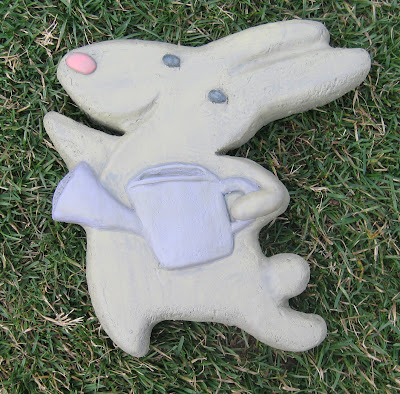 Click to view the content of this presentation The Summer/Fall Hypertufa and Handmade Paper Studios have been scheduled. 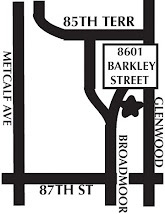 See the specific post for more information on what is involved and for sign up information. 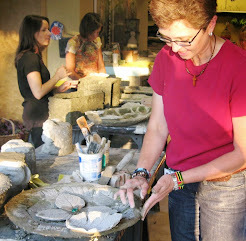 Participants taking the Hypertufa Studio can make up to five complete projects including a box planter, a leaf platter, a sculpted gnome head, a patio votive holder and a free-form garden stepping stone. mixing the sandand shredded paper into a pulp. This hypertufa pot has set but not cured. When it dries is will become very light in weight. 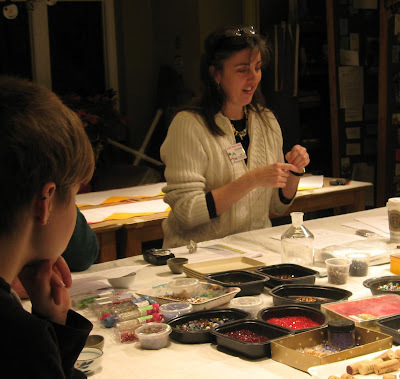 Erin Dennis was our guest artist leading our beaded bug workshop. The possibilities are endless and Erin did an excellent job of simplifying a pretty complex activity. The studio was humming like a bee hive with activity! 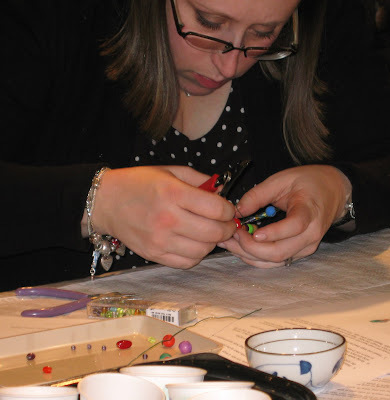 Jessica is positioning the beads that will form the body of her dragonfly. 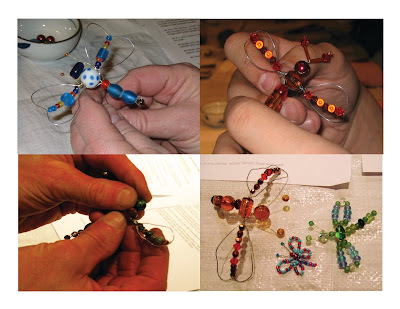 Examples of our finished beaded bugs.